Chocolate. Beer. Rain. Frites. More frites. More beer. And even more rain. That’s pretty much how I would sum up my time spent in Belgium. 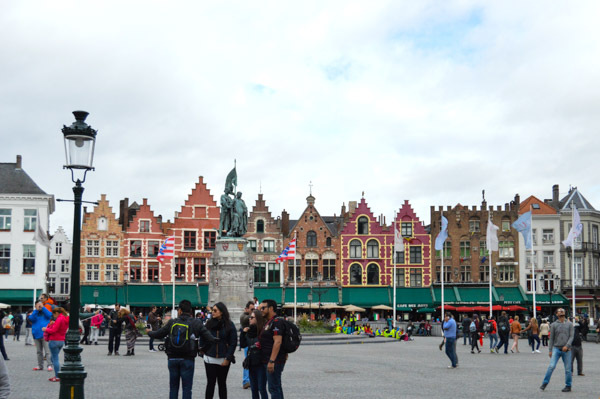 I had a great few days in Brussels and Bruges and it was a nice relaxing break from the hustle and bustle of Paris. 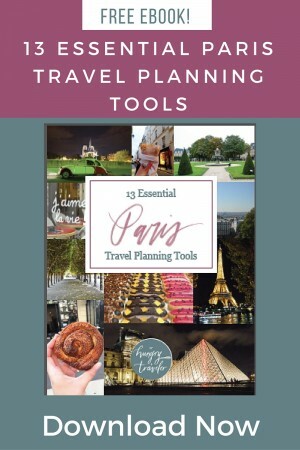 While there isn’t a ton to do in these cities (though I’m sure you could pack your days if you wanted to), we enjoyed the food and found the people to be friendly and gracious. I would definitely go back. As I am writing from abroad and struggling with spotty wifi, please excuse and typos and grammatical errors. This is not intended to be my best, most well-editing writing, but instead a casual journal entry. I met my friends Annie and Biff at the Brussels train station. We took a taxi into town, dropped our bags off, and found some lunch. Little did we know that our first stop was the best frites shop in town. Fritland fries freshly cut potatoes in beef fat. Actually, they fry them twice so they are extra crisp. You can get them on top of a sausage, as pictured below, but I think you really only need the fries. I recommend the samurai sauce – it’s a spicy mayo that’s incredibly good. 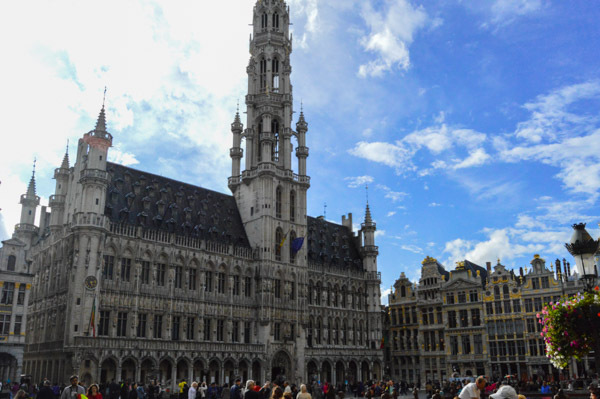 Brussels is known for a picturesque town square called Grand Place. It’s one of those places that is so massive and impressive that it just can’t be captured in photos. We started with a free guided tour. Our guide was entertaining but the group was quite large and hard to herd around. 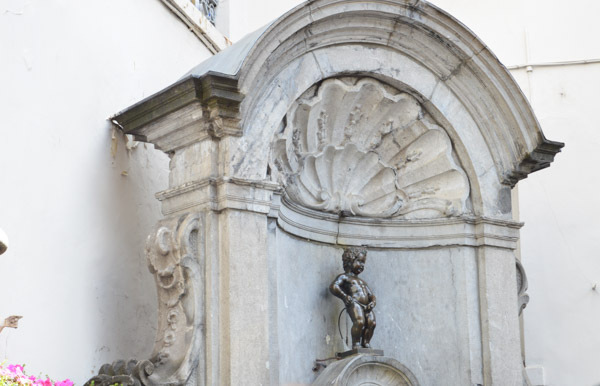 And we saw Brussels’ famous Mannekin-Pis statue. The statue is small and really quite strange. I didn’t like it at first but I guess it grew on me while we were there. Then it started to rain and we lost interest in the tour. We passed by the famous Delirium Bar and stealthily removed ourselves from the tour and settled into the bar. 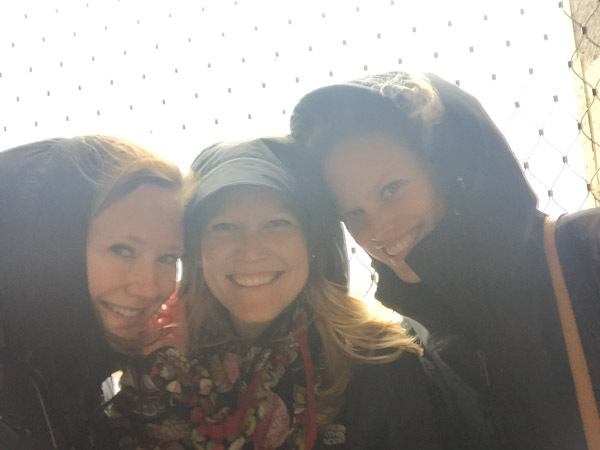 This was our first day of the trip and we hadn’t quite got the hang of the three person selfie yet… and it was post rain storm so please excuse the wet dog look. 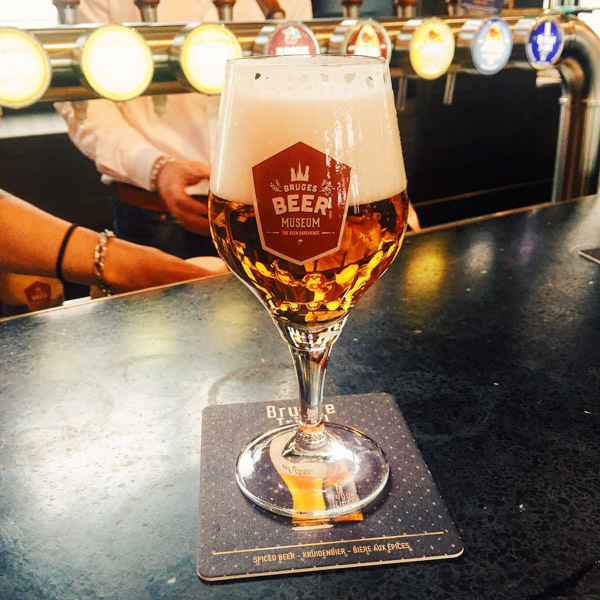 We stopped by the Belgium Beer Museum. It looked promising from the outside but turned out to be essentially one dark room inside. At least the beer was good. 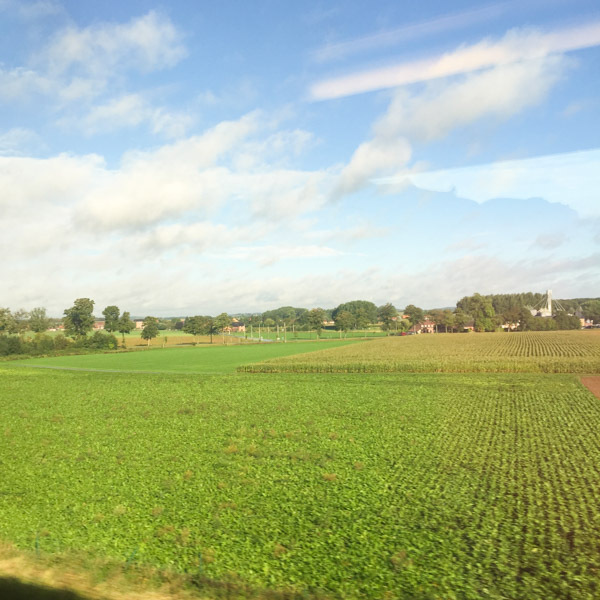 On the train from Paris to Brussels I sat next to a woman named Stephanie who lives in Brussels. She’s originally from Lebanon and told me to check out a Lebanese restaurant in Brussels called L’Express. We gave it a try on our first night in town. The food was good but the most memorable part of a meal was when the guys sitting at the table next to us asked if they could finish our leftovers. I don’t usually eat food from strangers but to each their own. 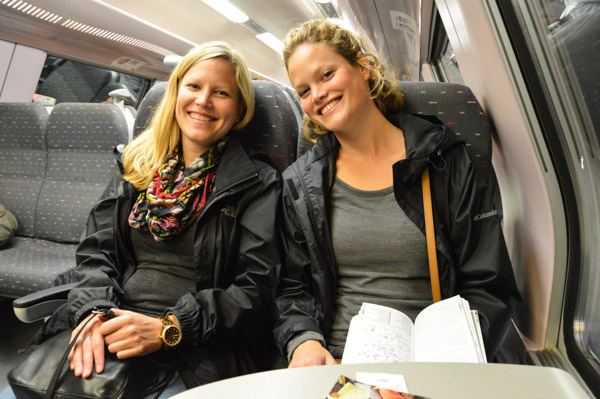 We took an early morning train from Brussels to Bruges for a day trip. It’s only a relaxing one hour ride between the cities and you can just buy train tickets the morning you wish to go. 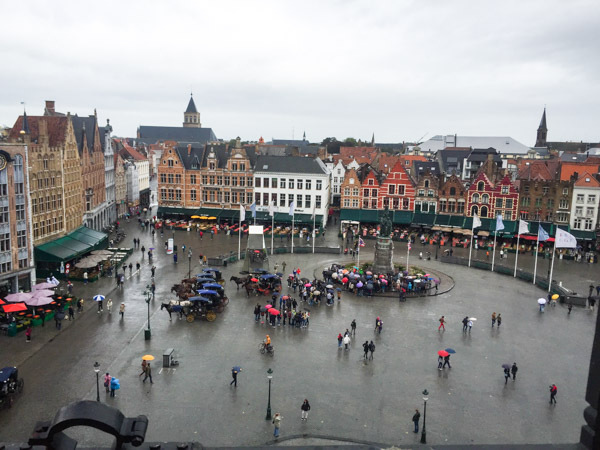 It rained the entire time we were in Bruges but we tried to make the best of it. We started by climbing this clock tower. It was 366 steps and not a terrible climb (though very narrow in parts!) but once we got to the top it was so cold and windy that the rain was blowing viscously. We couldn’t see much of anything and could barely stand up straight so we headed back down quickly. 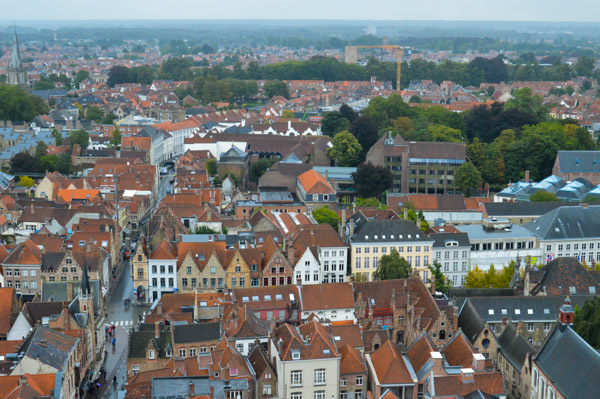 Bruges is a quaint, picturesque little town. I loved it in the rain and I can only imagine how lovely it is on a sunny day. 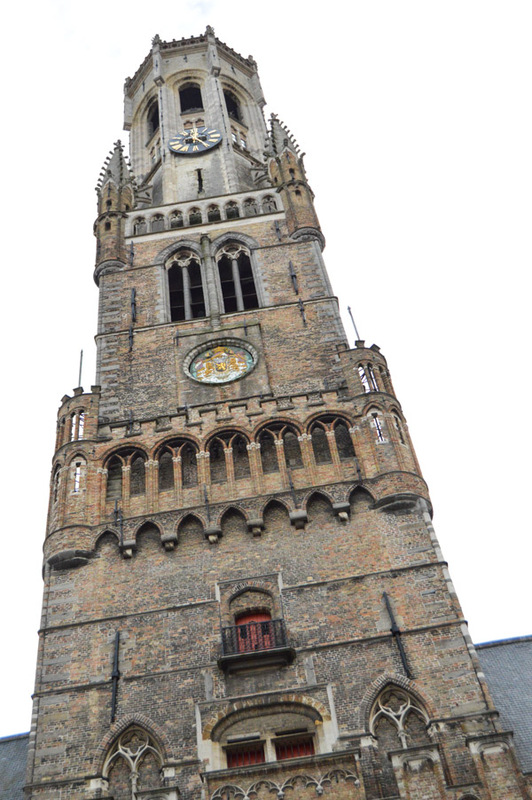 While the sun was no where in sight, I hope you can still get an idea of the beauty of Bruges. I don’t really like calling a city ‘cute’ but Bruges is very cute. I’ve been told I need to watch the movie In Bruges. If you’ve seen the movie, many of the pictures probably look familiar. I have it downloaded but keep falling asleep even before the opening credits are over. 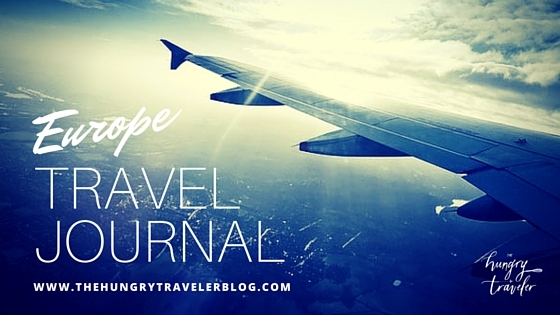 Travel will do that to you. 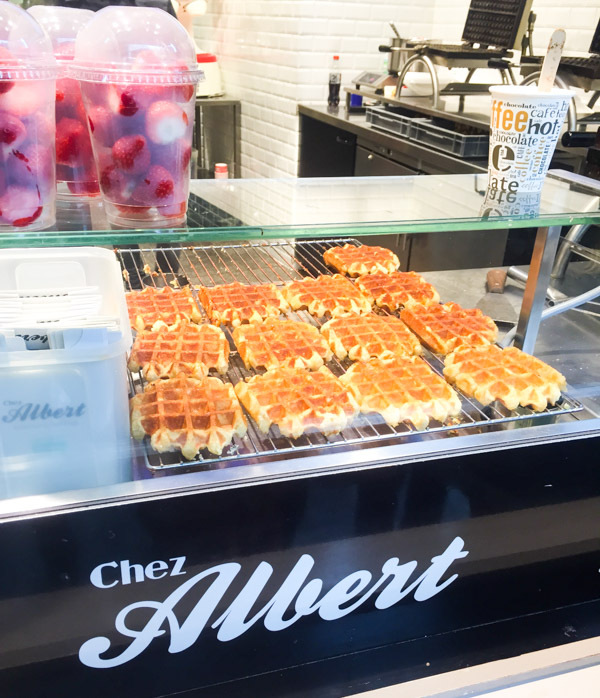 I tried several waffles in Belgium and these from Chez Albert in Bruges were the best. 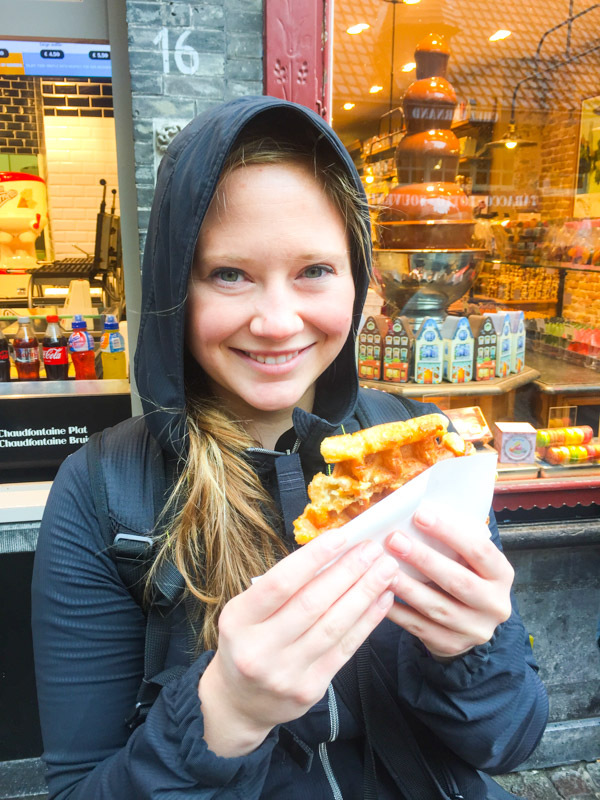 They were Liege-style waffles that are made with a thick dough and have pockets of crunchy pearl sugar hidden throughout. 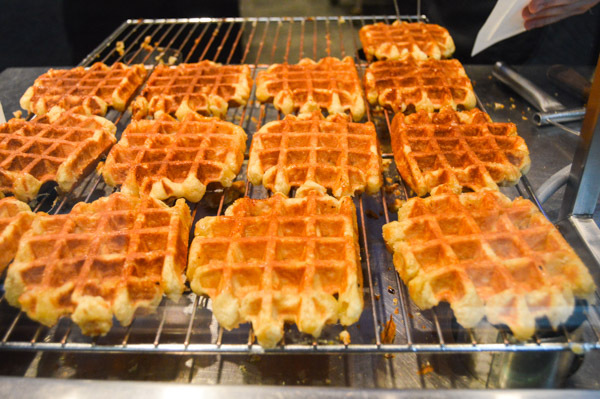 Although they are everywhere, not all waffles in Belgium are created equal. Try to find a stand where they are making the waffles fresh and not heating up pre-made ones. There are plenty of toppings available but I prefer to eat them plain. They are sweet and so deliciously caramelized that covering them with chocolate and strawberries just masks the flavor of the actual waffle. 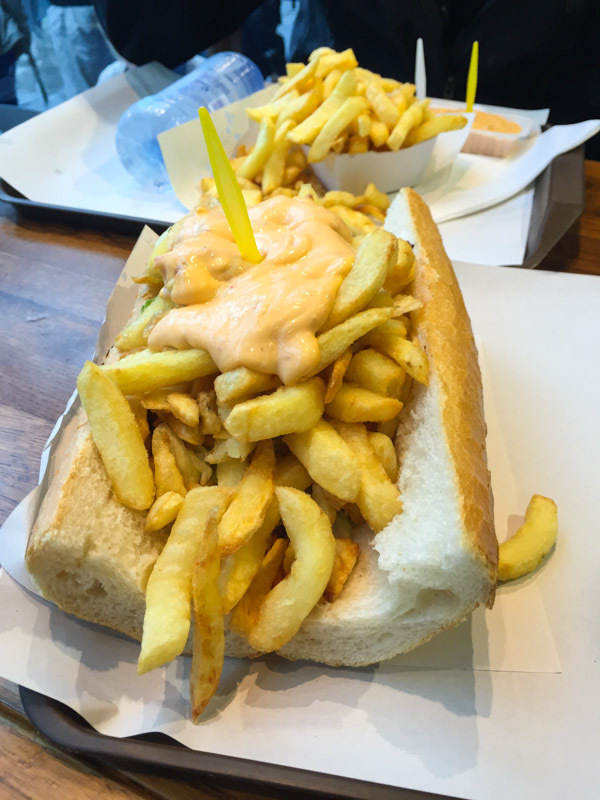 From what I am told, Belgians only ever eat them plain. 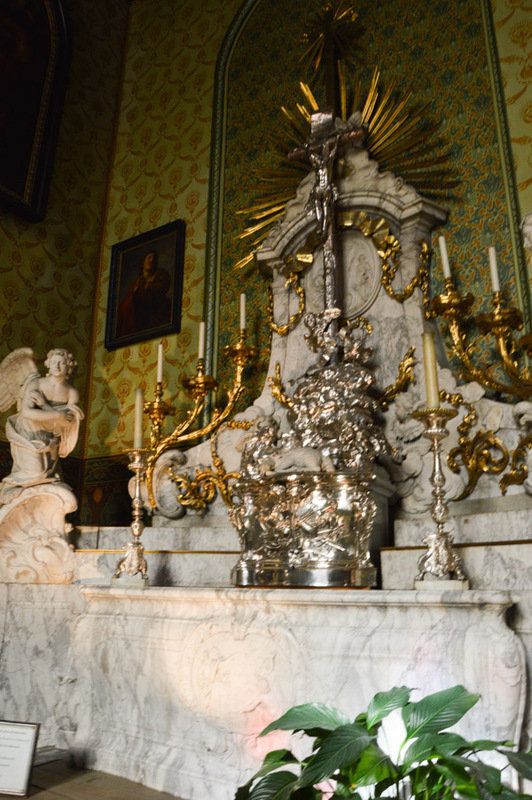 We went into this church that is supposed to have a drop of the dried blood of Jesus Christ. 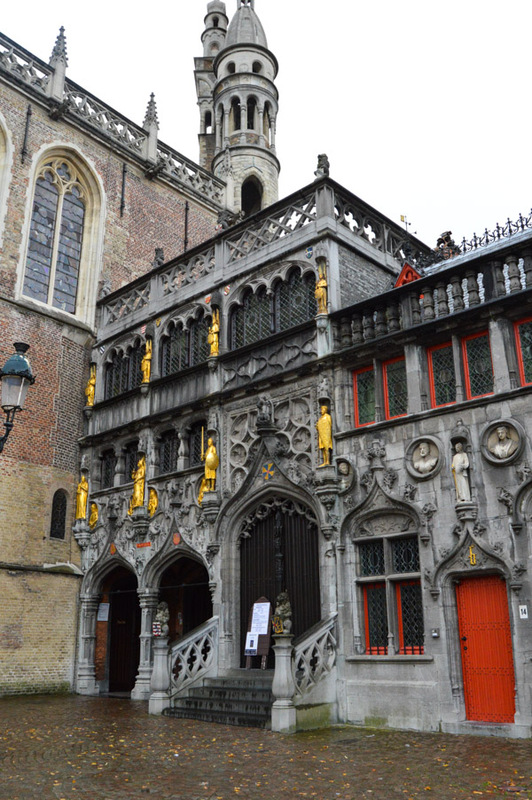 When the rain got annoying, we headed into the Bruges Beer Museum. When you buy your ticket, they give you an iPad. To move through the museum, you use the iPad to scan the different numbers on the wall and then it tells you about the picture or item on display. It’s an interesting attempt at being interactive and starts out as fun but quickly gets cumbersome. However, the tasting room is fantastic. The ticket includes three tastings (one of them is pictured above) and all of the beers are delicious. It’s a nice place to relax or hide from the weather outside. I’d recommend skipping the museum and just heading straight to the tasting room. 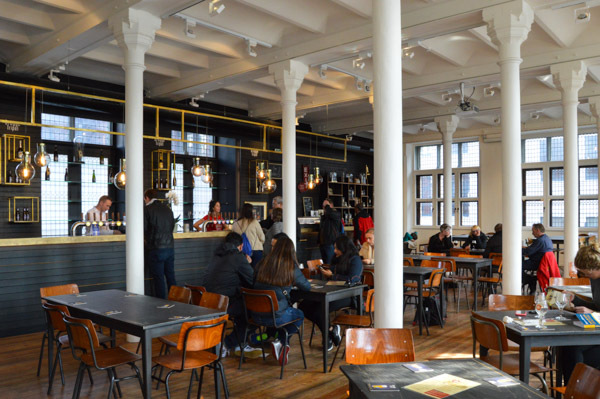 After a visit to the beer museum, a natural next stop is for frites. 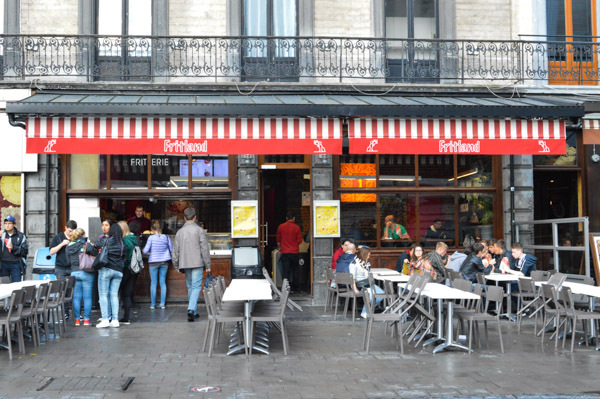 There are two main frite stands located just underneath the clock tower. I bought these from the stand on the left side and they were phenomenal. 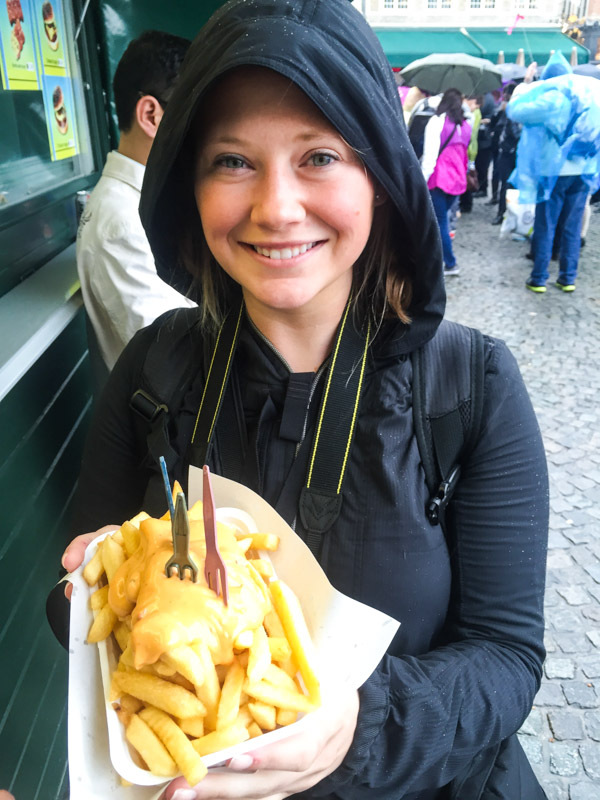 We took the train back to Brussels and set out to try the another classic Belgian specialty: moules-frites. 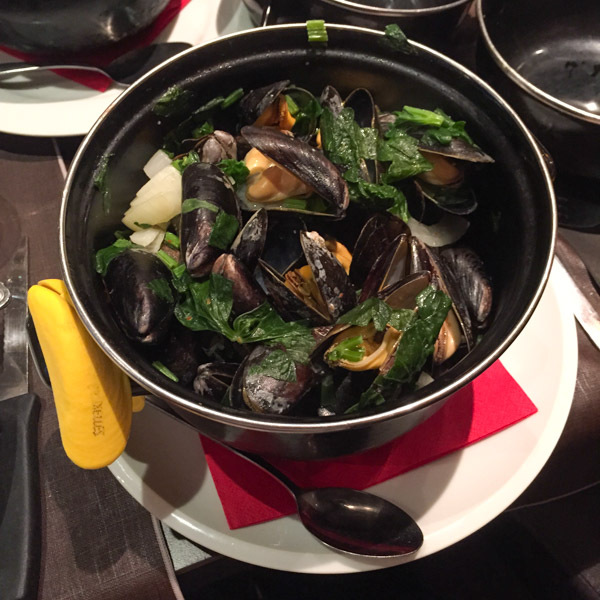 We went to Le Chou de Bruxelles, a restaurant located in the Ixelles neighborhood in Brussels. When we arrived, they said there was no room for us without a reservation but after a few minutes of convincing they said we could have dinner if we promised to eat quickly (quickly for a European meal is still leisurely for Americans). We had classic vin blanc (white wine) mussels and a diablo version with red chili. Both were delicious. We walked across town and toured the European Union Parliament museum. It was interesting to see the building but the museum itself was overwhelming and maybe even a bit boring. 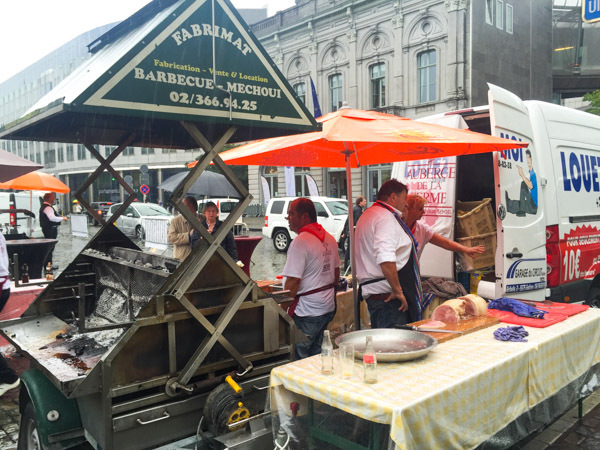 We left the building to walk to lunch and ran into some sort of local street fair. 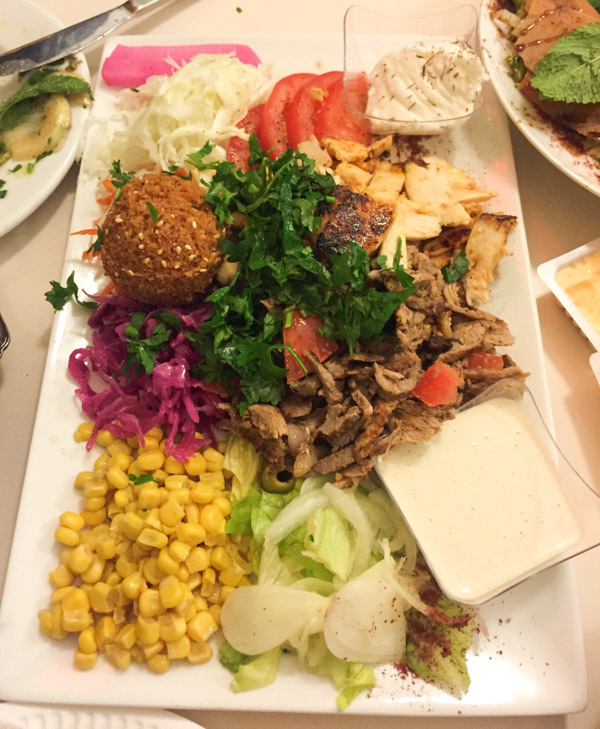 The food looked so good that even the pouring rain didn’t stop us from eating outside. 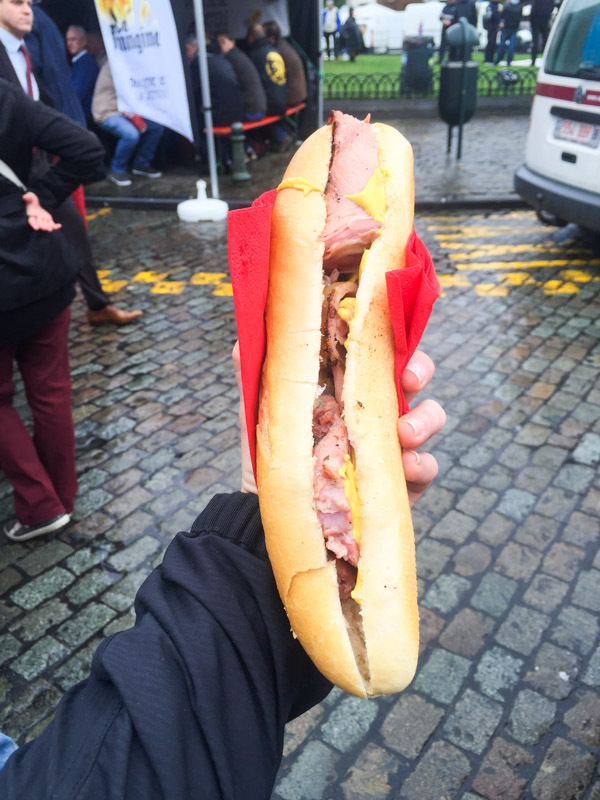 I had this sandwich of roasted pork and mustard on a baguette. 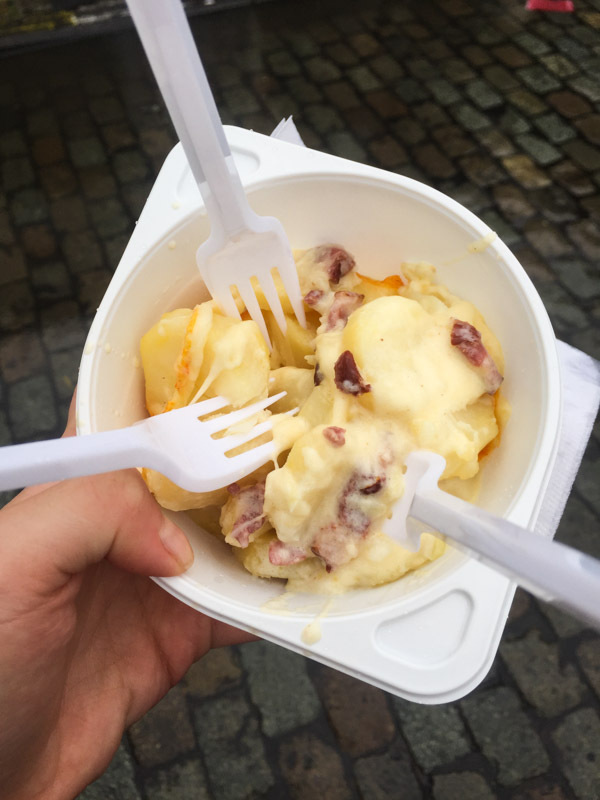 I also came across this potato dish called orvaliflette that is the ultimate comfort food. It’s potatoes, cheese, bacon, cream, and beer. Here’s a picture of the stand where I bought the pork sandwich. 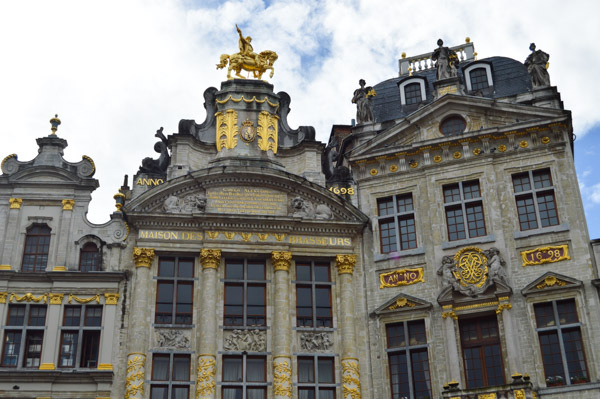 Later that afternoon we had a Chocolate and Beer Tour with Marie of The Brussels Journey. 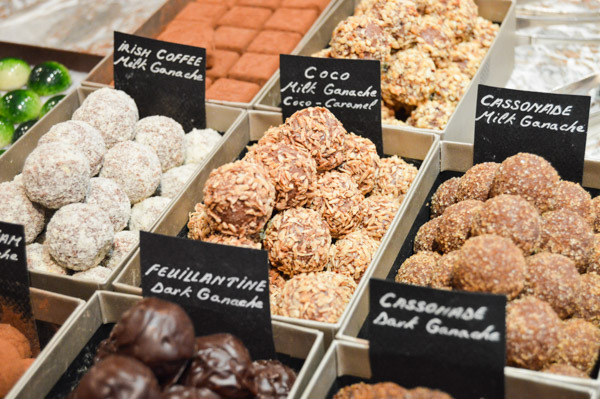 We went to 7 different chocolate shops and had multiple samples at each one. 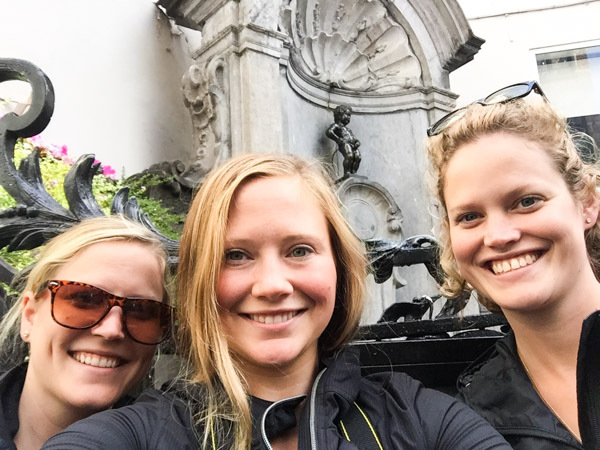 They really are obsessed with the Mannekin-Pis statue. You can even buy him made out of chocolate. After we finished with the chocolate tastings, we moved on to the beer part of the tour. 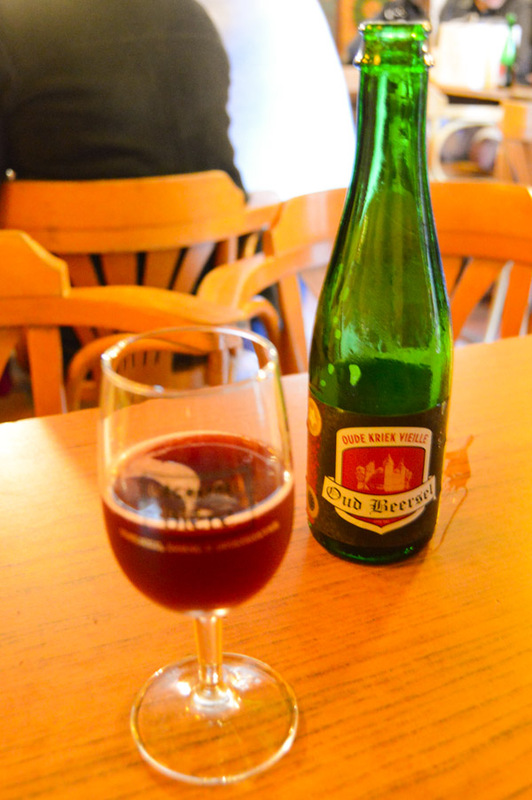 We started with a classic Belgian cherry-flavored lambic called kriek. 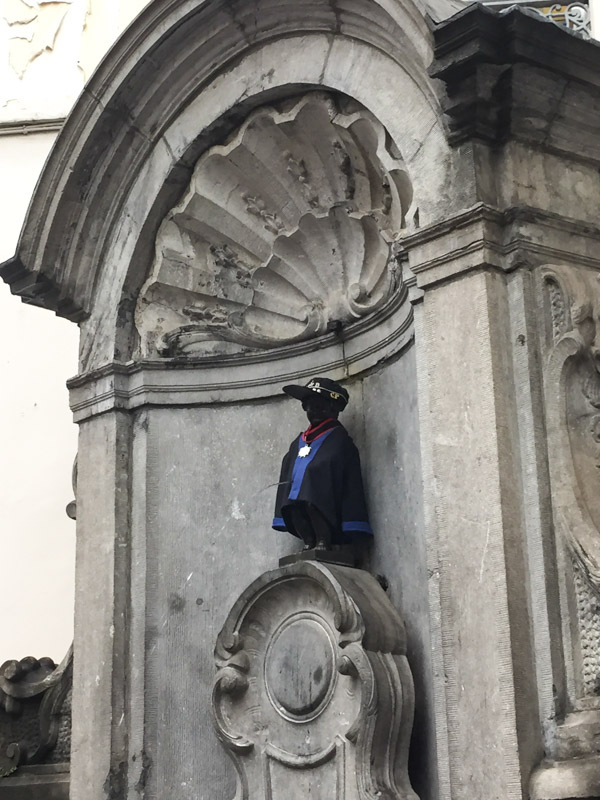 They dress the Mannekin-Pis up for different occasions. On our last day in Brussels, he was dressed up for a celebration at one of the local universities. Apparently the fraternities have some sort of big event and the statue was wearing a replica of the outfits the frat guys wear. 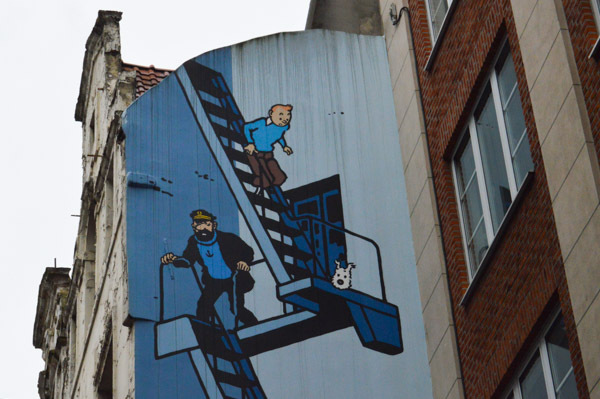 Belgian is known for comics and Tintin is especially popular. You will see him popping up all over town. 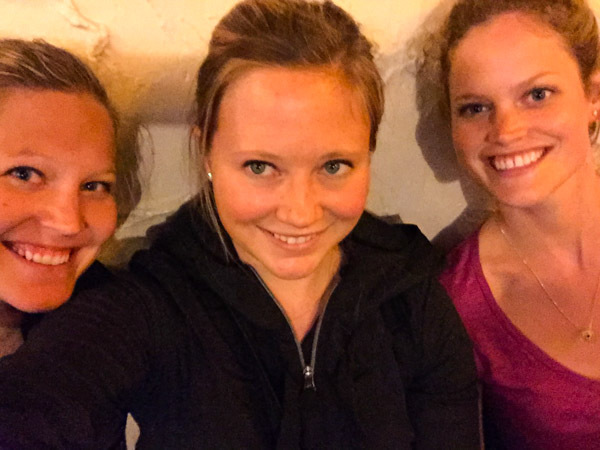 By our third day together, we had slightly improved our selfie taking skills… or maybe it was just all of the beer and chocolate that helped. 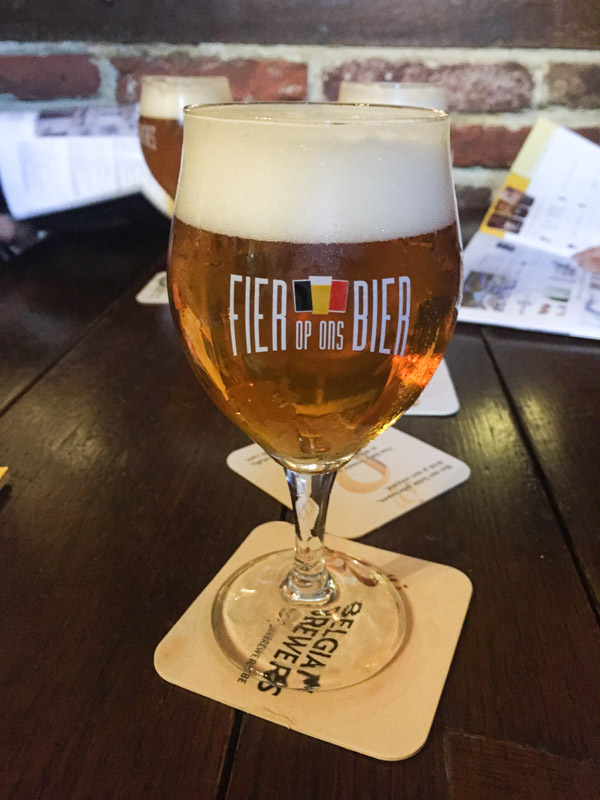 I really enjoyed Belgium. 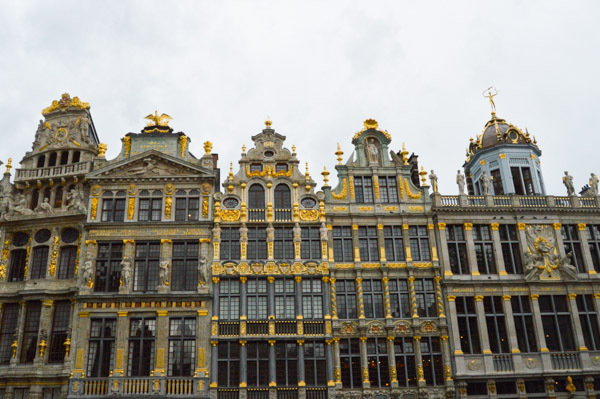 We ate plenty of good food, met some wonderful people, indulged in Belgian beer, and relaxed in the picturesque cities of Brussels and Bruges. Check back soon for my next update on Amsterdam. 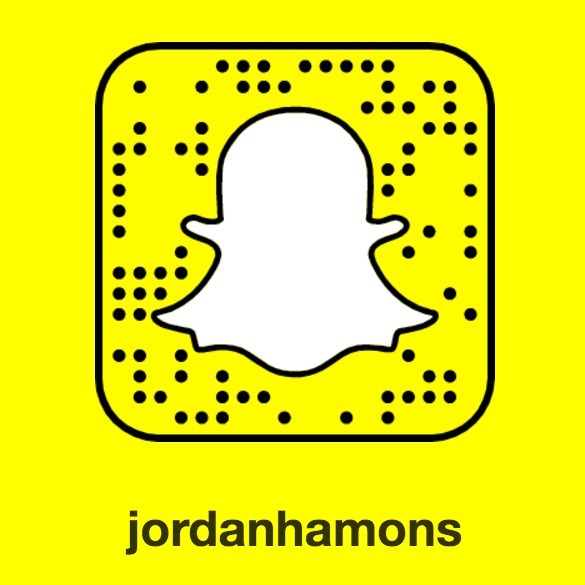 I’m posting more frequent updates on Instagram and Facebook so you can also follow me there to keep up with my day-to-day happenings. 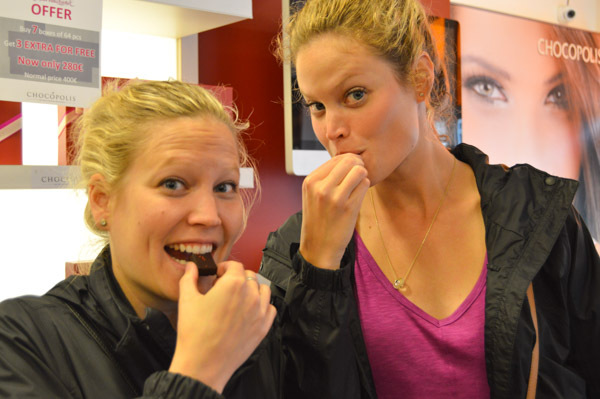 Enjoyed meeting you on the Beer and Chocolate tour. After the tour we went to Amsterdam for two days and then England for two weeks. 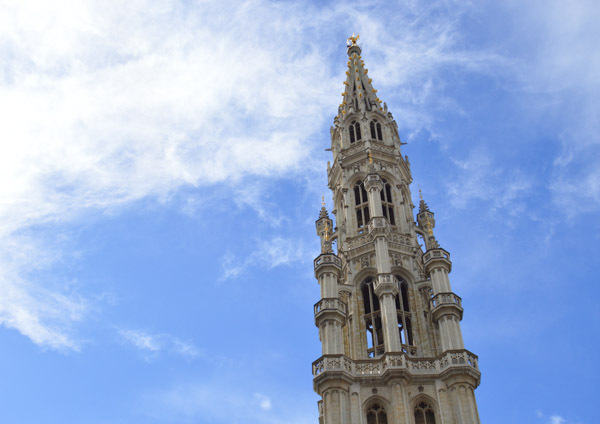 Our time in Brussels was the best. The chips in "Fish and Chips" are a very poor substitute for frites. 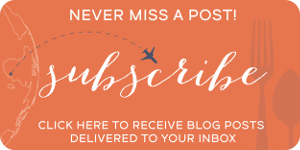 I want some frites now-----Enjoying your blog. You made the Beer and Chocolate tour fun too. Hi Robert & Judi! 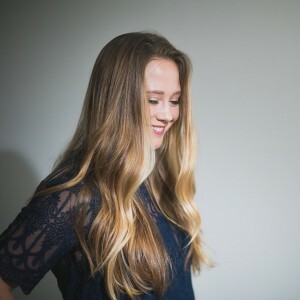 Thanks so much for finding my blog. It was great to meet you on the Beer and Chocolate tour. 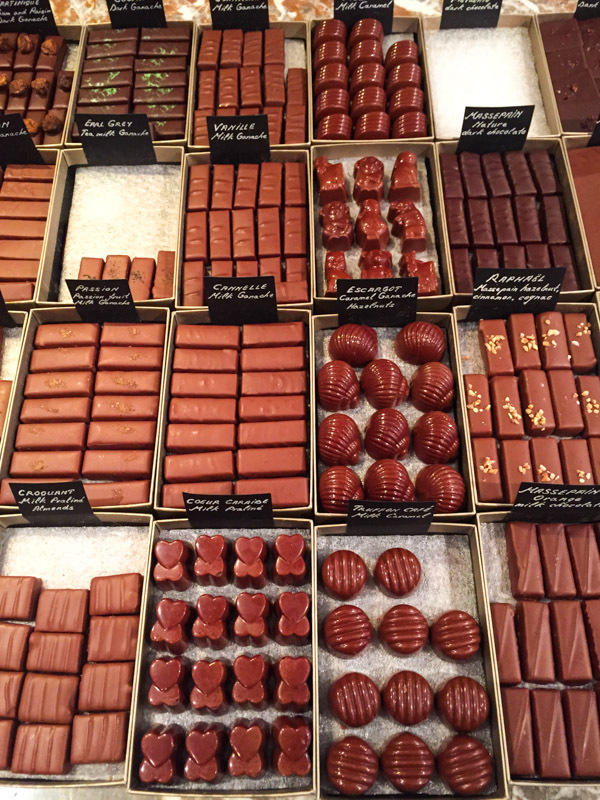 I just got back from Europe yesterday and I think the Beer & Chocolate Tour was one of the highlights of my trip. We went to Amsterdam after Brussels too and had a wonderful time. I hope you enjoyed the city too. Two weeks in England sounds amazing... I am jealous!